On a serious note, coming out with sh&t like this is irresponsible from a so-called human rights activist. How are companies like Lidl robbing us everyday?! They provide a great service for families in disadvantaged areas especially. He's a twonk. That's my new word for today, twonk. He’s a massive wanker with a massive chip on his shoulder. He’s a typical traveller who thinks he and his ilk are victimised by the rest of the country. He's a nobody that did astonishingly well - the stars aligned for him and I admire what he made with what he had to play with ... but there are no hidden depths to the man. It would be like me playing the part of a guy doodling on the net when he should be revising for exams to huge accolades. Not bad whataboutery regarding the bankers and politicians. Not the best representative judging by his tweets. He is only further destroying an already poor image. ''I’ve heard from directors and casting agents my politics doesn’t help, not least the Traveller movement which I speak out about. 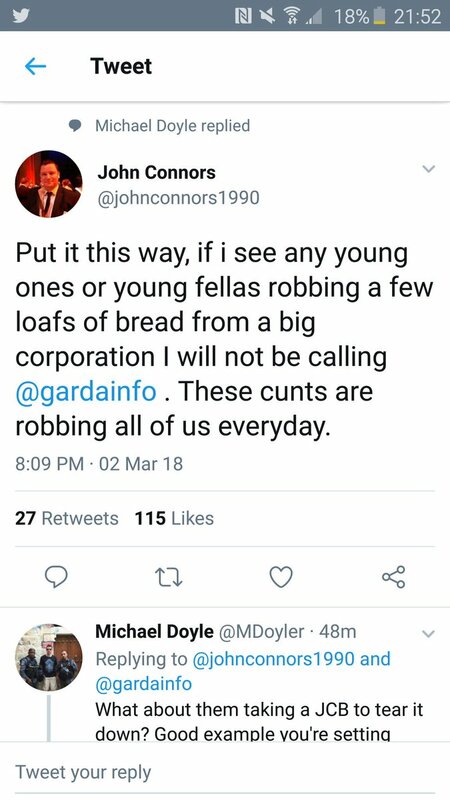 Maybe you're just not that good John. Cardboard Gangster played by a cardboard actor. Sometimes you have to grateful to twitter for their number of characters limit. Everyone uses the bankers but to be honest with the last crash we had them by the balls and what did our guberment do... Yes you guessed it gave them all the power back and even sold off nearly all the shares so they can't touch them. What was stopping them keeping the power and running the banks to serve the Irish public. We have gone from 1 working family to 2 in order to maybe some day been able to buy but rents are out of control so it's impossible to save.